BACK in 1994, I went to live in Rome for a year, which then turned into 12 years, writes Bootle-born Pat O’Hare. After a few weeks of trying to find a cycle route that didn’t put me in danger of being killed every time I went out, I discovered from Angelo, the concierge of our apartment block, that there was an ride at 13.00 every day at Tor di Quinto. The route was between 50 and 80 kilometres on the via Tiberina, which ran north alongside the Tiber, and the meeting place was about five minutes from where we lived near Ponte Milvio. So I turned up one day, accompanied by Angelo, and rode with the bunch. The lunchtime meet was for anybody. Sometimes there were more than 100 cyclists and I rode with them almost every day for the next 12 years when I wasn’t travelling for my job. It was the first episode of my journey into a cycling paradise of Saturday morning races and Sunday Granfondos. It was a group of friendly, helpful, non-competitive, brilliant people that welcomed me with open arms. What a contrast to some of the miserable people whose bunches I had the misfortune to ride with in England. No moaning about drafting or trying to ride you off their wheel, no stupid competitiveness and no trying to ride you out of the bunch. 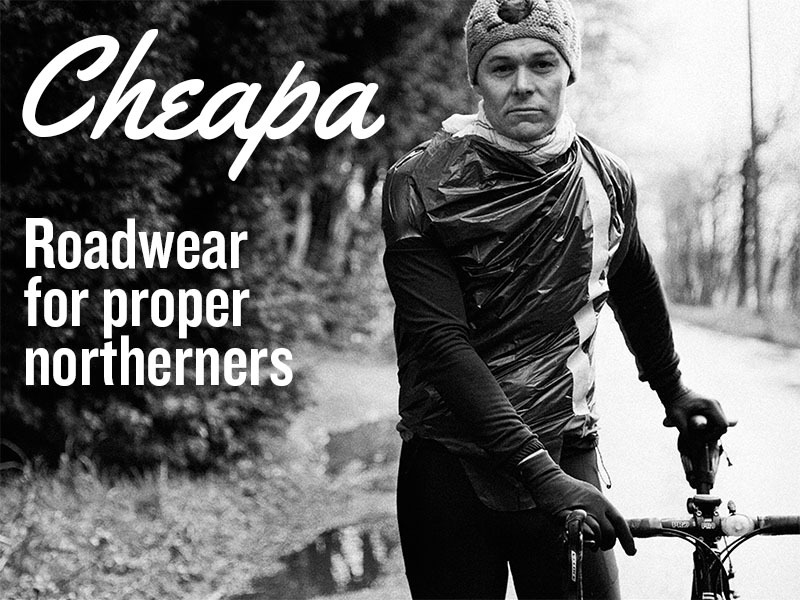 That is what real cyclists are like. It was a cycling heaven. Soon, the group organised itself into ability levels when we hit the first climb at 25 kilometres. But on the days when we only did 50 kilometres, everybody waited for everyone else at the bar having an espresso. Another big difference is that it’s possible to have a quick espresso in Italy. One day, Daniele Rosini, a giant of a man who could pull a bunch along at 40K an hour all day, spoke 10 words that changed my life. “Ciao Patrizio, here is someone I think you should meet”. He introduced me to Gian Luca Donato. This was a meeting that was to take me into a world that I couldn’t ever imagine existed, never mind that I would become part of it. 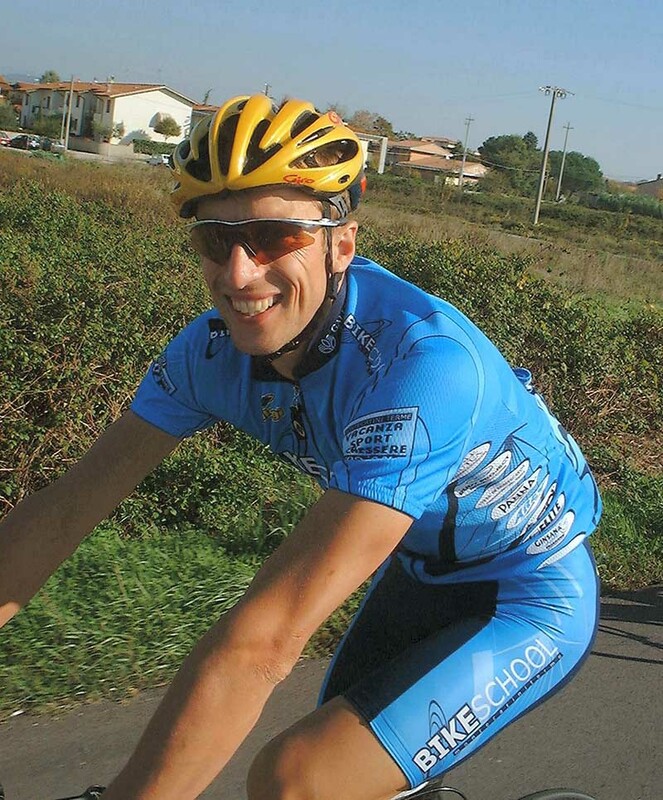 Gian Luca was a cycling journalist from Rome. He was several levels above me as a cyclist, and he was living proof of the five-a-day nonsense. Gian Luca had never eaten a vegetable in his life and rarely ate fruit, yet he managed to be selected for the Italian triathlon squad and was a beast of a cyclist. 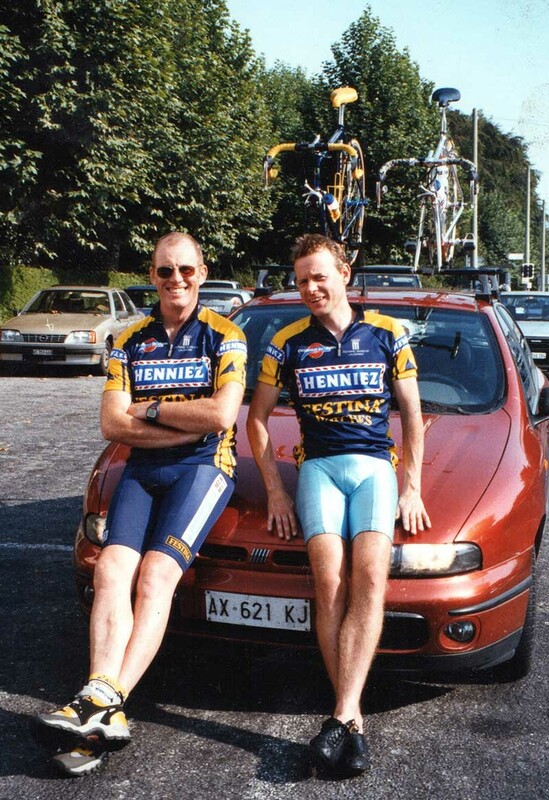 He took me under his wing and turned me into the cyclist that I never believed I could be. He taught me how to pedal, how to ride on a wheel, how to ride in a bunch to avoid ‘l’elastica’, how to climb, when to sit, when to stand and when to rest. I soon met Giovanni Bruno, director of RAI Sport and later of Sky Sport Italia. Giovanni was a red haired Italian, who told everyone at school that he was a Scot so they wouldn’t skit him about his red hair, which is pretty rare in Italy. To this day, Gianni is a passionate supporter of the Scotland rugby union team. Later on, we were joined by another great friend, Brian Sieger, an ex-patriot American from New York, with whom I shared hundreds of Saturday or Sunday morning rides when there was no race. 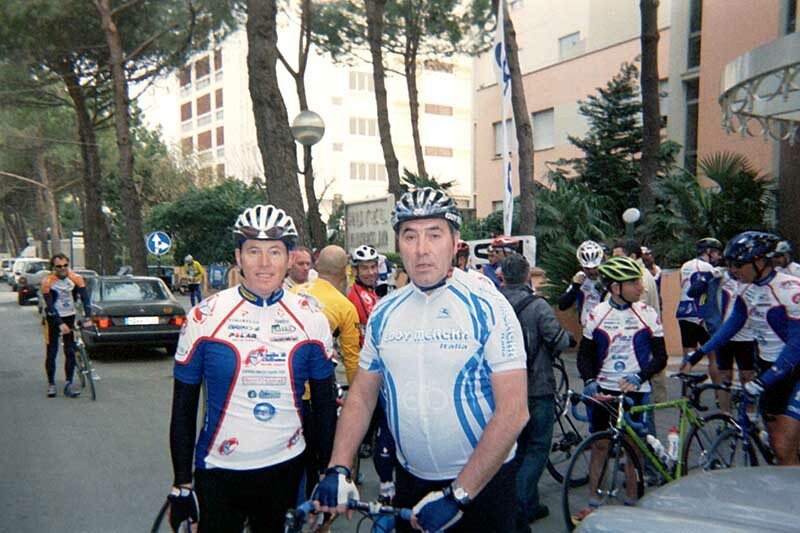 I used to do Saturday races with Gianni and Gian Luca, generally doing well until we hit the climbs. That was me done and I used to make my weary way to the finish. Although I learned to climb, and to descend, I was never going to be a climber. I was a ‘velocista/passista’, a sprinter who could ride tempo at the front of the bunch. I will never forget the day our race was stopped at a level crossing to allow the peloton of the Giro to pass. The minute the gate was up we all sprinted after the bunch, and then rode through a small town in the peloton. I was busily chatting to Mario Cipollini. Only in Italy. Then there was my solitary victory, albeit an age category victory, in a bunch sprint of the Superpolpach, a 60 kilometre race around Lago di Vico outside Rome. 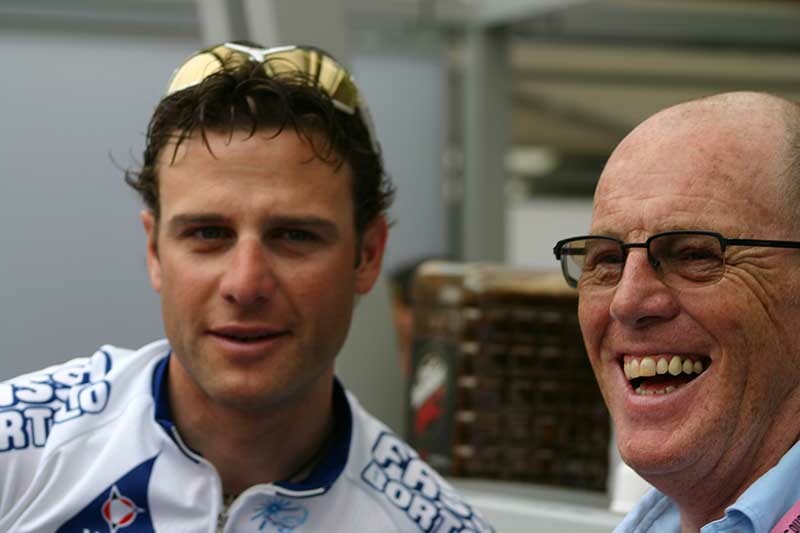 Through them I met Maurizio Fondriest, one of the nicest people I have had the pleasure to know. We became great friends and we still see each other when we can. 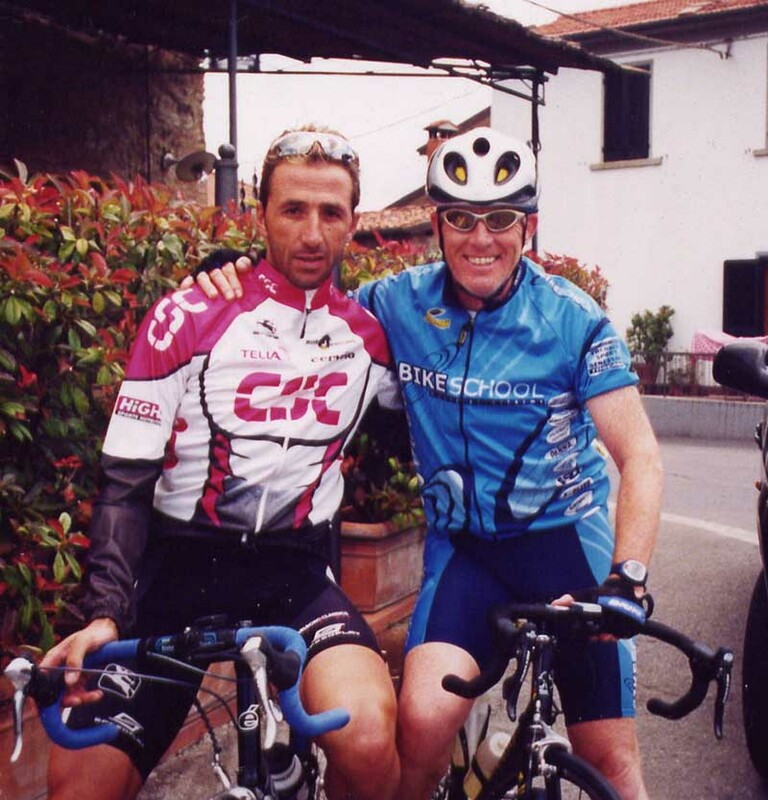 Riding with Maurizio, which I did very often, was the best thing I have ever done in my sporting life. 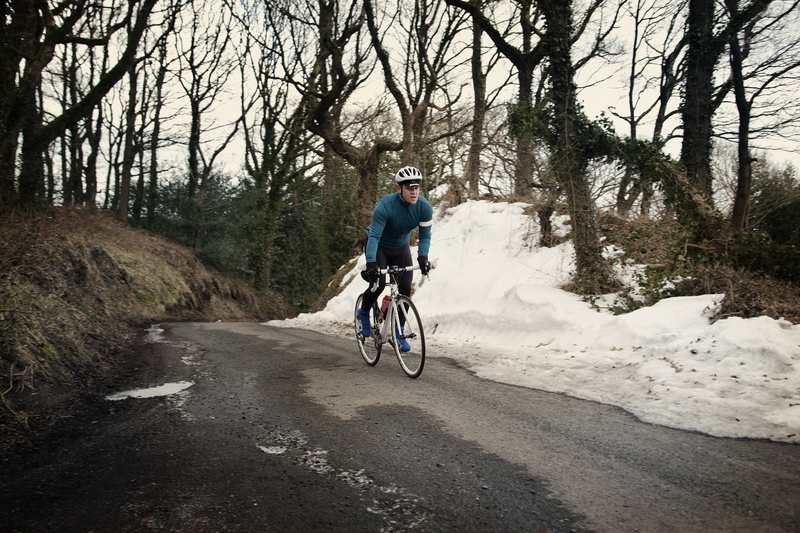 The great thing about cycling is that you can do that. 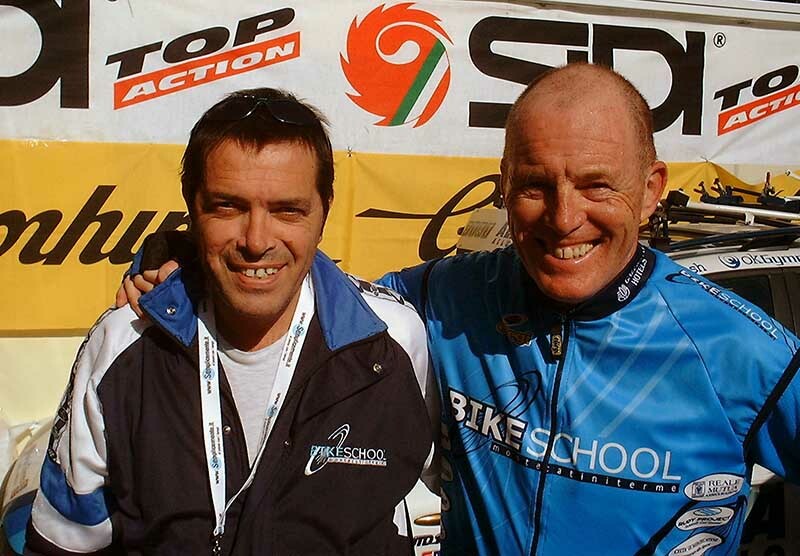 You can ride with pros, a world champion in Maurizio’s case. You can’t do that in most other sports. What would be the equivalent in football to riding in a bunch with Maurizio and Francesco Moser pulling you along at 50ks an hour? Maurizio taught me to descend, which was an incredible experience. 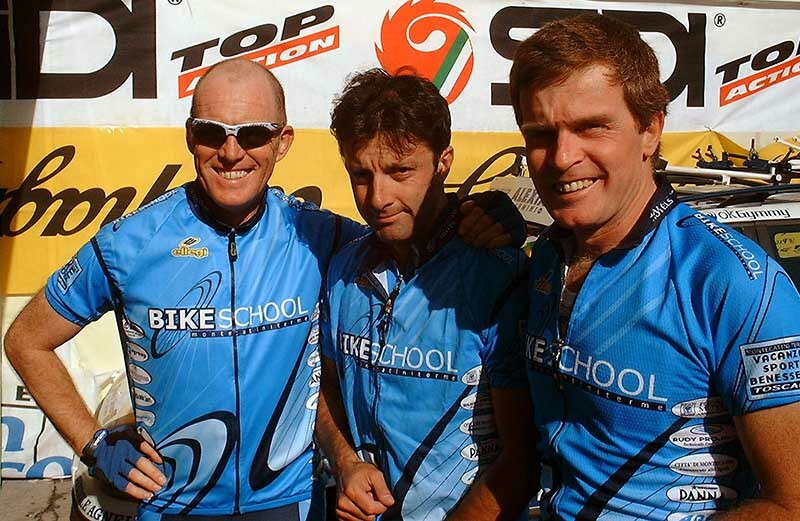 Maurizio had an annual Bike School in Montecattini Terme in Tuscany. It was a week of living like a member of a professional cycling team. We were treated like pros with a massage after rides, and we rode with pros like Andrea Tafi and Ralf Sorenson. 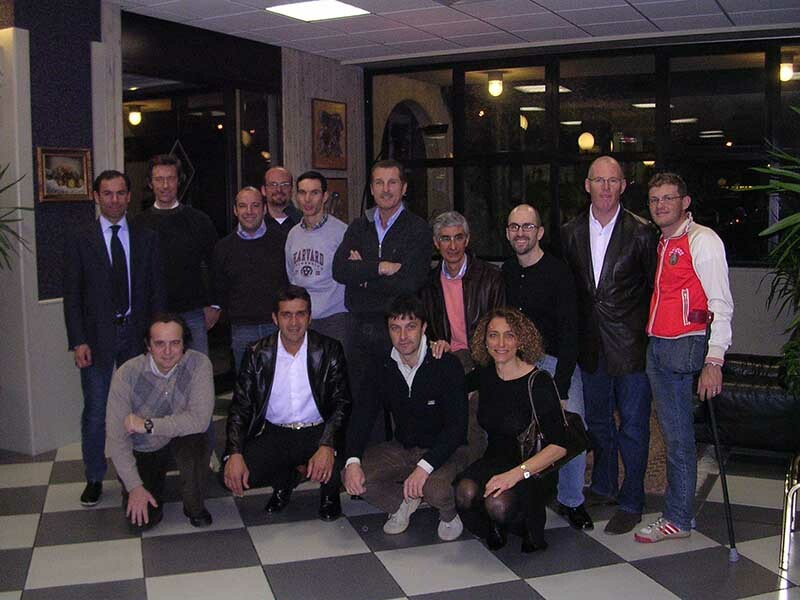 Davide Cassani also had a training camp near Cesenatico, which was the same kind of thing. That’s where I rode with the great Eddy Merckx. 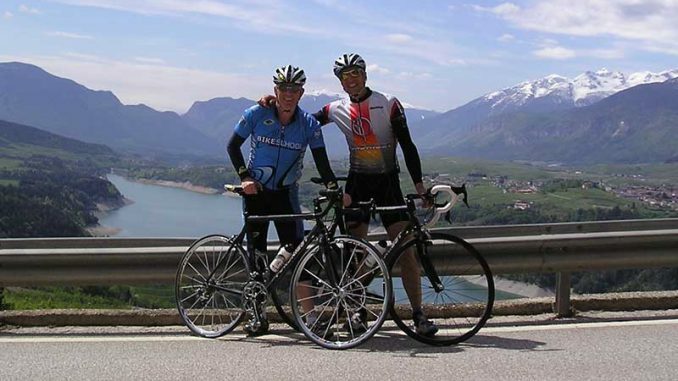 Then in 2001, after a few granfondos in different parts of Italy, I was taken to Alto Adige to discover the most amazing cycling experience you could ever have. I was about to do my first Maratona dles Dolomites, which was the first one on totally closed roads. If you haven’t experienced the Maratona, you really can’t know how amazing it is. First of all, it is set in one of the most beautiful places in the world. It is incredibly well organised from start to finish, and the roads are completely closed to cars. There are three distances: 55 kilometres with four climbs (the famous Sella Ronda); 106 kilometres with six climbs, although the ride to the finish after you descend from San Cassiano counts as a seventh climb in my book); and 138 kilometres with seven climbs including the mighty Giau. Until my last couple of Maratonas I did the middle ride. It’s hard to describe the beauty of the scenery, or the incredible atmosphere created by thousands of cyclists descending on one valley in Italy. Some cyclists make a week of it, and others just come for two or three days, but you will never see more cyclists in one place. The day before almost everyone rides some part of the course. Our ride was always up Passo Campolongo, coffee at the top and back down again. The roads are completely dominated by cyclists. There is hardly a second when you don’t see a cyclist ride past. On the Friday and Saturday, there are queues of cyclists to overtake the cars on the descents from the passes, which lead to Corvara. After an early night, at least that is what I always intended, it was up at 4 o’clock and down for breakfast. It isn’t easy to eat pasta at that hour of the morning, but I managed to get it down me, as well as a load of cakes and biscuits. Then it was a ride to the start in the dark and into the various pens to wait for the gun at 6 o’clock. There I always asked myself what on earth I was doing there rather than being in bed. The helicopter was already in the air. There is nothing quite like the noise of the helicopter blades to make you feel like you are in something really big. I knew I simply couldn’t be still in bed. Then at 6 o’clock you are off, going much too fast up a big long drag hoping that you don’t get taken out by thousands of cyclists as they overtake you. You hit the first climb to Passo Campolongo, which is not too difficult, but the descent from the top is crazy. Everyone is still bunched together so there are still fast riders and slow riders in close proximity. You proceed through the mythical climbs of the Giro: Pordoi; Sella; Gardena; Campolongo again; the Giau if you take the long course; the very difficult Falzarego; and then the killer Valparola. You do the beautiful descent into San Cassiano before you come to the Mür dl Giat, or “Cat’s Wall”, before a final long drag to the finish at Corvara. One year, I descended from Passo Gardena to Corvara on Maurizio’s wheel. I decided if a World champion didn’t fall, I wouldn’t. We touched 92kph. It was the most amazing 9 kilometres I have ever ridden. My good friend Ian Parr has ridden it many times with me and came to my aid when I thought I’d had a heart attack and was helicoptered off the Pordoi. Turned out to be indigestion. Ian is just as evangelical about the event as I am. 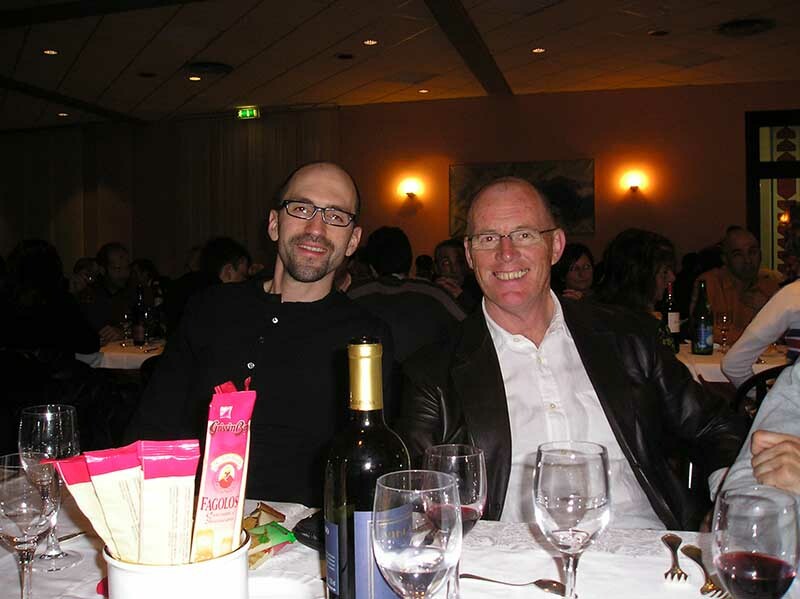 He says that introducing him to the Maratona was the best thing I’ve ever done for him. I’ve had some wonderful experiences at Maratona: being in awe of Fabrizio Macchi, Paralympic bronze medallist and twice World time-trial champion overtaking us on the ascent of Campolongo despite having only one leg; trying to keep up with Paralympic gold medallist Pierangelo Vignati; sharing a joke or two with the wonderful Riccardo Magrini, stage winner at the Giro and Tour in 1983; being pushed up the Madonna del Campiglio by Fondriest after I hit a wall on a training ride a few days before the Maratona. I wasn’t pedalling and we were doing 14kms an hour much to the amazement of Ian, Brian and some other friends as we passed them. Then despite being an enormous football fan, managing to sleep through the Germany v. Brazil World cup final of 2002 after an exhausting ride. So finally, thank you everyone with whom I shared these golden years. Thank you Mario Carbutti, great friend and owner of Cicli Lazzaretti, the oldest bike shop in Italy and his son Simone; Andrea Prandi with whom I shared many rides around Rome; and a massive thank you to the Maratona dles Dolomites. I recently drove to Corvara in Alto Adige/Sud Tirol for the 30th anniversary of the Maratona to see my friends with whom I rode it for many years. A bad mountain bike fall a couple of years ago prevented me from riding it.